Faced with an economy that is quickly running out of steam, Washington needs to step in with fiscal policy where the Fed’s monetary policy left off. Just under a year ago, the popular opinion was that the U.S. economy was strong and the Federal Reserve would need to tighten soon to slow the impending inflationary pressure. In fact, much of the commentary at the time was critical of Fed chair Janet Yellen for being behind the curve. Fast-forward to March 2016, and opinions have reversed. Demand data, such as retail sales, personal consumption expenditures and consumer confidence, appear to have turned. Monthly indicators are showing broad-based weakness in economic growth, and inflationary pressures are no longer material. 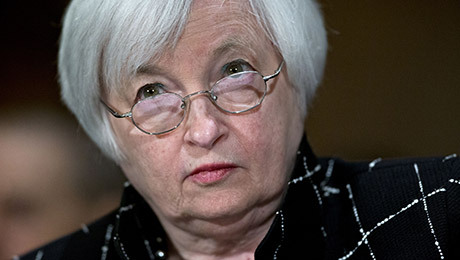 In her February testimony to Congress, Yellen expressed substantial uncertainty about the future and, in particular, how the global economy will react to three factors: the sell-off in global financial markets, the deflationary effects of the oil price drop and the slowdown in Chinese growth. The negative turn in economic conditions and the uncertainties that lie ahead have led many economists and investors to call on central banks for another aggressive round of quantitative easing. But bringing back QE in the U.S. is likely to be both ineffective and dangerous. The answer at this stage lies in Washington rather than with the Fed. If the Fed were to implement liquidity injections, it would continue a 35-year cycle of monetary easing that began in the early 1980s with falling interest rates and continued with the asset purchases implemented by Fed chief Ben Bernanke following the 2009 subprime mortgage crisis. 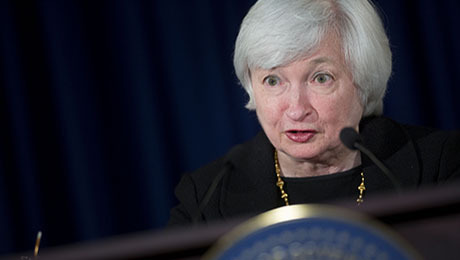 Sitting in her predecessors seat, Yellen is largely powerless. The real danger is that it becomes increasingly difficult to sustain inflated stock market valuations when the economy experiences the inevitable next big downturn. Yellen faces a situation in which asset prices are highly elevated and the yield curve is flat: a nasty combination with a great deal of downside risk. The analogy that comes to mind is pushing a boulder up a mountain that is increasingly steep. As Yellen nears the peak, she must use more and more effort to gain less and less ground. Additionally, both the chance of a slipup and the danger of the boulder falling farther down the hill worsen. The disproportionate downside risk comes from the fact that there is less room for assets to rise through risk premium contraction and that there is less room for the yield curve to flatten during a sell-off. This downside risk is exacerbated by high debt levels across the economy. Additionally, although banks and households have deleveraged slightly and debt service has come down, total private debt (250 percent of gross domestic product) is still high. The ability of the private sector to take on more debt is low, and there would be substantial risk were it to do so. Whereas a flat yield curve is manageable, a flat yield curve in a zero interest rate environment with high debt levels is challenging. The U.S. economy has not experienced a flat yield curve with near-zero interest rates since the 1930s. Under such a scenario, the central bank is unable to sufficiently cut interest rates to boost economic activity and asset prices, and yields are not able to cushion the fall in price-earnings ratios during a market sell-off. 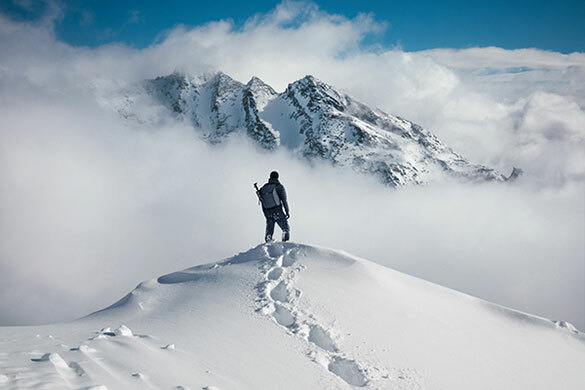 For investors, that means limited upside with elevated downside volatility. It is imprudent for Yellen to start raising interest rates quickly or to stop rolling over the QE assets already on the Fed balance sheet. A safer course of action would be to continue pumping liquidity into the U.S. economy, until fiscal policy solidly steps in and offsets monetary action. Lets examine the interaction of monetary and fiscal policies. Real GDP represents the total production in an economy during a given period. When you plot RGDP over time, you will see that it fluctuates around an upward trend (see chart 1). This trend is the potential output of the economy. When output is above potential, the economy is tight and inflation is rising. When output is below potential, excess capacity puts downward pressure on inflation. One can see this more easily by looking at the output gap, which is the difference between actual and potential GDP (see chart 2). 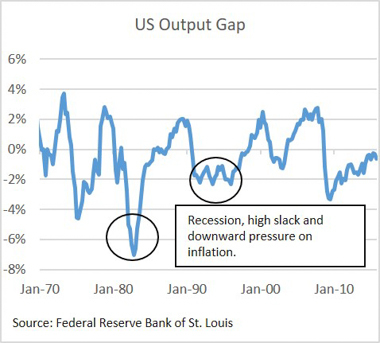 The output gap, just like the unemployment rate, approximates how tight the economy is and therefore indicates the pressure on wages and inflation. Potential growth measures how much more the economy can produce each year without eating through excess capacity. Although we can measure U.S. potential growth in many ways, it has two main components: labor force growth (roughly 0.5 percent) and productivity growth (about 1.5 percent). In the past seven years, the U.S. has undergone an unprecedented monetary stimulus that has predominantly worked through the wealth effect (the rise in stocks as a driver of consumption). Growth has run above potential, and slack levels have almost normalized. 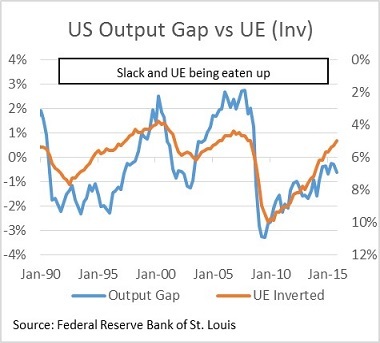 The Feds goal is to maintain a level of economic activity that is neither inflationary nor disinflationary  that is, to target a neutral output gap. 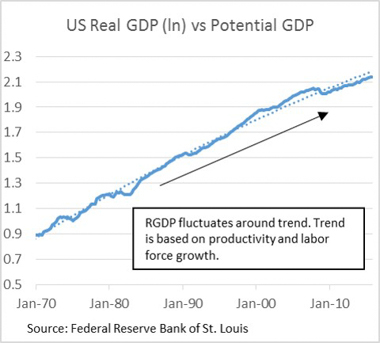 The Fed is able to affect the output gap by accelerating or decelerating economic growth through monetary policy, which alters the incentives of the private sector to consume. When the Fed cheapens credit by cutting interest rates, corporations and households lever up. When it boosts asset prices, households spend down savings. 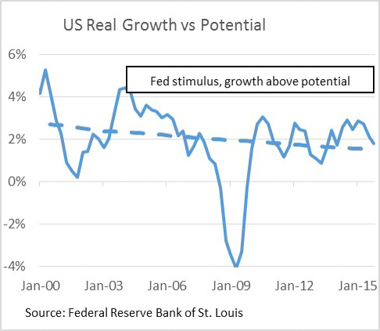 Significantly, although the Fed can cause fluctuations in growth around potential, it does not have the tools to directly alter the underlying trend (see charts 3 and 4). Todays unfortunate congruence of circumstances  high debt levels, low productivity and used-up monetary policy tools  is not problematic if growth continues to be strong and above potential. The danger arises when growth falls below potential, and the slack that the economy has eaten through (or that unemployment gains the labor market have enjoyed) starts to come back. On its own, wage growth is unlikely to normalize, and the risk of significant economic downturn grows. Socially, the U.S. ends up with a continued disenfranchisement of the middle and lower classes. Politically, it is not difficult to imagine why antiestablishment candidates like Donald Trump and Bernie Sanders have gained such unexpected and broad support. Unlike monetary approaches, fiscal policy can direct investment into the real economy in a targeted way. Fiscal policy, however, is harder to implement: The government will have to overcome political gridlock in Washington and invest in an intelligent manner. There is precedent for effective government spending, like Franklin Delano Roosevelts New Deal recovery programs, but there are also multiple examples of botched government intervention. If successful, fiscal policy can have numerous benefits. First, it can offset the fall in private sector growth that will come as monetary policy becomes less and less effective, leading to a short-term boost to GDP growth. When the private sector is unwilling to borrow, the government can provide that credit creation, and government spending can replace monetarily fueled private sector consumption. The second effect of fiscal policy is the long-term boost to productivity and the change in the slope of GDP growth. Focused, smart investments that increase the productive capacity of the economy generally boost real wages. The list of government-sponsored projects that would add long-term productive value to the developed-world nations is lengthy. In the U.S., a significant portion of the infrastructure is in need of an upgrade. Investments in roads, transport and municipal facilities can materially support future productivity. Investments in alternative sources of energy would decrease dependence on oil-producing nations as well as lay the groundwork for sustainable future growth. Investment in education would go a long way to normalizing the wealth and income polarities that currently plague the U.S. and other nations. 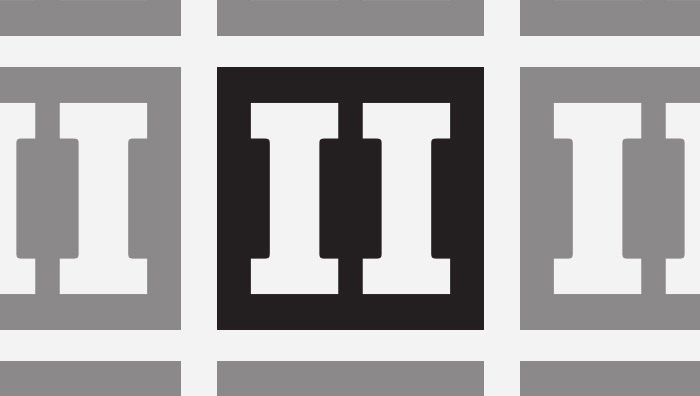 The third effect of fiscal policy has to do with its capacity for precision. Intelligent fiscal projects allow the country to direct resources to specific problems, rather than increasing the wealth of the holders of financial assets across the board. For example, the New Deal put thousands of the unemployed poor to work, giving them both livelihood and dignity after the start of the Great Depression. With very little fuel in the tank to implement effective monetary policy, fiscal stimulus must pick up the slack. Not only will fiscal action fill the hole left by increasingly ineffective monetary easing, but it will also give developed-world governments an opportunity to invest in the future and narrow the income and wealth gaps that have accelerated over the past ten years. Katina Stefanova is the CIO and CEO of Marto Capital, a New Yorkbased multistrategy asset manager. From 2005 to 2014, she served as an executive at Bridgewater Associates, holding both investment and senior management roles. 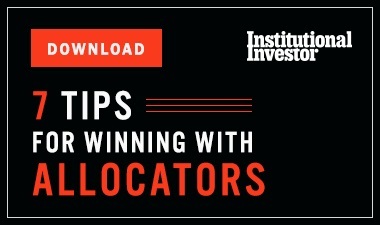 During her tenure, the Westport, Connecticutbased hedge fund firm grew from $20 billion to $150 billion in assets under management.